Now that the Winter Season is officially over, this is the time that we notice our skin and how dehydrated it looks. During the Winter months our facial skin really suffers as we have the central heating on in the home and then go out into the cold weather outside, so our skin goes from one extreme of temperature to another, these temperature fluctuations can lead to sensitivity as we go from hot to cold, leading to impairment of the skins natural barrier function. Skin can become red and flushed as the body adjusts to the temperature differences, leaving facial skin parched, dull, tight feeling, dry, irritated and sometimes it can actually look older than what it is with fine lines appearing if we are not taking care of our facial skin like we should. With Spring officially here and the warmer weather now upon us, this is the perfect time to combat the effects of Winter with this hydrating, repairing facial designed to give immediate improvement to the skin, leaving it nourished, supple, fresh looking hydrated, toned, protected, smooth and revitalised. Make sure you protect your skin by using products specific for your skin type that contain an SPF to protect from the Sun. Beauty starts from within so make sure you eat a healthy balanced diet and drink plenty of water and take up some form of exercise. 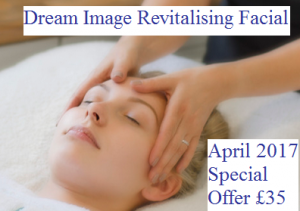 Contact Us At Dream Image Today To Book Yours.